We grow elderberries in our Wisconsin home landscape and use the fruit for jelly and wine. The juice, balanced with a bit of grape and aged on oak, produces a fabulous wine, comparable to a cabernet. willowrichrd | October 23, 2010 | Blue Elderberry (Sambucus caerulea) is a common, large shrub in the Pacific Northwest of the USA. This species and many others of the genus are edible and have valuable use as antiviral medicine. 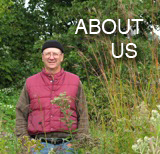 Here Michael Pilarski, Skeeter of Friends of the Trees takes us collecting berries in fall of 2010. Later, he shows us how to process and dry the berries also providing narrative on their uses.